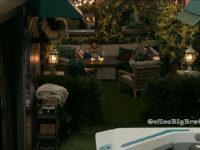 3:33pm – 8:55pm The live feeds return from being blocked. Dina – what do I do during that? Ricky – the veto ceremony .. Lolo will get up there and she will say I’m using or not using.. Dina – she’s keeping the veto ..obviously. So then I get that but what do I do Tuesday? Kandi – we don’t do the vote until Wednesday. Dina – oh so I’ve got to wait!? Kandi – everyone leaves the same day. Dina – so I don’t have to play the other games though right?! So I don’t have to do the thing tomorrow right?! Ricky – the HOH? Dina – no, yeah! Ricky – tomorrow is the veto ceremony. Dina – oh! So I still have to do that? Ricky – do what? You just have to sit here.. that’s all you have to do. Dina – no right but I don’t have to compete in anything? Ricky – we’re not doing any competition tomorrow. Dina – or Wednesday? Ricky – if you get evicted you don’t. If you don’t get evicted you do. 9:20pm HOH room. Lolo and Ricky. Lolo – I would like to talk game with you but I am just not feeling good right now. Ricky – okay. Lolo – but I do what to talk game with you and Tay. 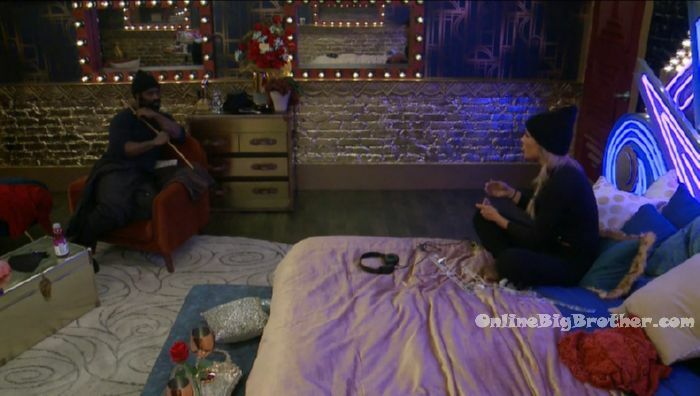 Just because it is the last veto obviously but I want to talk to you and Tay but I am just not feeling good right now. Hopefully if I take like a shower or something.. Ricky – yeah just let me know. Lolo – I am glad that it was one of us though. Ricky – yeah, that makes everything much easier. Lolo – did you beat Kandi? Ricky – I beat Kandi. Lolo – but it was close? Ricky – yeah it was like 30 seconds. Lolo – hopefully I will feel better and we can sneak away tonight. Will we have time tomorrow morning or no? Ricky – I’m sure we will. Ricky leaves the HOH room. 9:26pm Bathroom. Lolo and Tamar. Tamar – let me ask you a question. Is there a plan that I don’t know about or something? Lolo – what do you mean? Tamar – because I just saw Kandi and Dina slapping hands. Tamar – So I just want to make sure that I’m not about to be backdoored or some sh*t. Lolo – I am not backdooring you.. Tamar – okay. Lolo – but I also wanted to talk to you about ..since you’re .. I didn’t like the conversation I had with Kandi last night. She essentially said that say she won .. she is not taking me. So why would I f**king have her.. why would I save her? You see what I’m saying. Tamar – I do. Lolo – you see .. she f**ked up. But if I switch it you would go up but I know that I wouldn’t be voting for you. Tamar – I just want to know why they’re slapping hands and sh*t. Lolo – maybe they’re just happy that they did good you know? Tamar – no, they were talking about going out to dinner in Atlanta and sh*t. Lolo – well tell Ricky that. I think that they were just proud of how they did. Ricky joins them. Ricky – yeah they quit. They kind of gave up. Like earlier they were like they were just happy they made it this far. 10:40pm – 11pm HOH room. Lolo and Ricky. Ricky – you want to talk now? Lolo – yeah we can talk a little bit .. I just don’t want to fight. Ricky – we won’t fight. Lolo – okay.. I just want you to know that I value your opinions. I think you’re great at this game. I like how you think. I just want to talk over all the options. Ricky – I’m good at separating personal. Lolo – but at the end we’re all kind of personal. Ricky – I am playing the game but I also want to give you good advice. Lolo – there are so many things going through my head right now.. One obviously not to use it.. basically the alliance we have is solid. Obviously I feel safe. Tamar is nervous. She came up to me in the bathroom… I felt shocked that she said that because I feel so comfortable with us. Even if one of them would have won it .. kandi or Dina .. I would feel comfortable. I feel that we all had each others back in the game. Even though it would have been easy to get rid of someone at the same time why would we do that. I could keep it as is.. but I did not like that conversation with Kandi last night. Essentially she said she wouldn’t take me to the final if she won. What is the benefit of me having her in the final four? And she said .. I know she’s crazy but she said that I would get more votes than her. There is no way I am getting more votes than you. Ricky – first thing is … you have to trust the way you feel. IF you feel that she wouldn’t take you … then you have a vote but in order to get her out you two votes. Lolo – okay cool. But if I save Dina.. Ricky – you’re in a position right now that you can cut a deal with either of them ..if you want. So you could say if I use the veto on you and you win, will you take me? Lolo – right but what are the chances of one of them winning.. Leaving Kandi in this game makes me nervous. Ricky – she is more dangerous than Dina. Lolo – so I like that said that it doesn’t matter what I do. That reassures me. So it would come down to Tay. Either I don’t use it or I use the veto and you would have to go on the block and trust us not to vote you. Ricky – good luck with that. Lolo- or .. Ricky – keep it the same. If that is the final solution .. its clear that you and Tamar will not see eye to eye. Do you have a plan on how to deal with that? Lolo – no not really.. Ricky – you just have to do what is best for your game and that why you won’t have any regrets. 11:55pm Lolo is sitting by herself in the backyard. Meanwhile Dina and Kandi are playing cards. Tamar heads to bed. I think LOLO takes down Dina and has Tamar go up. Then Kandi goes. Why? LOLO was really annoyed with kandi last night or this morning. I don’t care who wins out of this bunch. BUT..the lesser of the evils I guess. Will someone spill the beans of final 2? Tamar and Ricki. Yes..they have that. Kandi and Dina? YES. Kandi knows she will win. LOLO was going to be voted out..no matter what..if she didn’t win veto. Lots of squirelling going on now. Everyone but ricki be scared. BUT..Ricki..the cocky POS is playing for who HE wants in final 2. UGH. Awful any which way now. Thank you Simon and Dawg for all of the updates, y’all are truly amazing! This has got to be a pain in your backside sometimes for sure. If Lolo wants Kandi out for sure then she should use the Veto on Dina. She would be dumb not to do that. She won it fair and square so use it or potentially regret it for a long time. Whoever wins the final HOH would want Kandi or Dina sitting next to them. LoLo needs to think for herself not listen to Ricky or Tamara. She should pull Kandi down put up Tamara vote her out and then her Kandi and Dina try to get Ricky out. Ricky has manipulated them all to do the dirty work so he could just get to the finale with no blood on his hands. UGH!!!! Of course Loco won the POV. This is literally a nightmare of an ending. At least the people left in the final 3 last year had some redeeming qualities, even if I couldn’t stand two of them and my number one Ross lost by sitting next to Marissa. Can you just imagine how production had to scrape up any usable footage of Ricky were he wasn’t just laying in bed or staring someone down? Tamar? I won’t even waste my breath on that fake tap dancing Christian. Loco? She really needs to take all of her footage from this season and her season on MTVs The Challenge to a good therapist who can explain to her just why she is a lonely 36 yr old virgin. And no, I am not interested in seeing a remake of The 40 yr old Virgin starring Loco Jones. Kandi has sadly grown on me and I hope a miracle happens and she makes it to final 3. This whole “she doesn’t deserve to win” and “she has too much money” BS from her “friend” Tamar is laughable!!!! This isn’t “Big Charity Case” or “Big Who Makes The Least Amount Of Money”. Unfortunately, her chances are pretty much ZERO at this point. Dina…wait, she’s still on the show??? Also, tamar proved she can win comps, kandi prob wont win the last hoh. Oh man this is the worst possible outcome, I was so hoping Tom and Kato would make it to the end, they were so funny to watch. Almost stopped watching after Tom left but now my curiosity has won out and I need to see who takes it. I’m in the Kandi camp as well, she may not have won comps but she was pretty much the only one who knew what was going on through out the whole season! She TRIED to talk sense into Tom but he wouldn’t listen, I sooooo wish he had, would have loved to see a final 3 of Kandi, Tom and Kato, they would have deserved to be there, can’t stand Lolo or Ricky and Dina has just been in the background the whole season…don’t even get me started on Tamar, oh man that woman irritates me! Loud and obnoxious! So bummed Lolo won the veto, I was really hoping Kandi would, I hope Lolo uses it and Tamar goes up but I doubt it will happen.